She grew up in America but she came through for Canada. 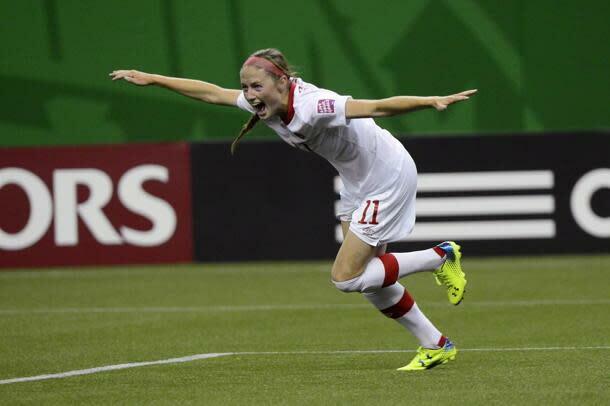 Janine Beckie scored the lone goal of the game for the host nation against North Korea in their final group stage match. The 1-0 win booked the Canadians a chance to compete in the knockout stage of the FIFA U-20 Women's World Cup for the first time since 2004. Beckie, a dual-citizen who spent her first three years in Saskatchewan, moved with her athletic family to the Denver area when she was three. Her brother Drew played as a reserve for the Columbus Crew (MLS) and her two sisters competed in collegiate soccer in Canada and the U.S. The 19-year-old forward struck in the 65th minute when she was left unmarked at the far post and tapped in Nichelle Prince's goalmouth pass. "It's history and that's what we talked about from the beginning of this tournament, get out of group," she said in a post-match TV interview. "We keep going from here, we live our Canadian DNA, we are workhorses and we never give up." In referring to Canadian DNA, the Texas Tech University student who is a standout for her collegiate soccer team - the Red Raiders, was echoing the words that her head coach Andrew Olivieri has been preaching since the team was announced in July. The concept of developing a new DNA in his players is a metaphor for instilling the aim of constantly improving upon their possession focussed style of play combined with a high standard for what they should expect from themselves on the world stage. Olivieri's goal was for Canada to win a quarter-final match in this tournament and now they have a chance to do that against the high-octane Germans in Edmonton on Saturday evening. However, their path to this point looked bleak not long ago. On Friday, his squad - who had already dropped their opening match to Ghana - was down 2-0 at half-time to Finland, a country that has never won a match at the Women's U-20 World Cup. Beckie, who subbed in to begin the second-half was integral in the comeback, getting Canada on the board with a goal in the 48th minute. In the late stages with the game tied at 2, she was the catalyst behind the game winner, brilliantly fending off a Finnish defender while cutting through the box and releasing a shot that rebounded to Prince who netted the difference marker. Their chances of advancing out of Group A had been given a flicker of hope and they were able to carry their momentum forward from Toronto to Olympic Stadium in Montreal where they faced a strong North Korean side. Canada played strong defensively and didn't concede a goal in the first-half for the first time in this tournament and when the final whistle blew, it marked the third consecutive game in which they won the possession battle. They also may have gotten a little help in the fact that talented North Korean striker Ri-Un Sim was held out of the starting lineup for precautionary reasons and did not enter the match until the second half. She netted two goals in their previous match Friday against Ghana. Combined with a 1-1 draw between Finland and Ghana in Moncton, NB. - the Canadians advanced as the second seed with a superior goal differential to West African nation. Olivieri continued to show that he is willing to be bold with his substitutions, removing Emma Fletcher in the 59th minute, the midfielder who exhibited a strong performance but gave way to a local - Amandine Pierre-Louis. The move paid off as Pierre-Louis provided a spark leading to Beckie's goal, starting the scoring play on a well executed give-and-go with Sura Yekka before finding Prince in the box. Canada is now charged with the tough task of facing Germany who lead the tournament with 12 goals and have historically preformed well at this tournament - winning twice, most recently in 2010. We’ll see you in Edmonton! Full time: #canW20 1-0 PRK.